So, I was the chosen one! I was given the opportunity to bring QII back from Newport, Rhode Island to Lymington, England after her owner, Mary Falk, had raced her in the opposite direction singlehanded in the Europe One-Star. 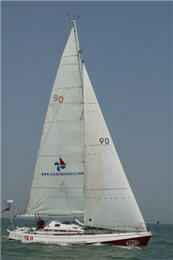 By way of introduction, QII is a 35ft water-ballasted racing yacht designed by Mike Pocock. The boat was designed ‘around’ Mary Falk as a competitive yacht for singlehanded long-distance races, with the emphasis strongly on the Europe One-Star. Most members will already know of her success. Joy was quickly replaced by concern – where does one start to prepare to skipper such a craft across the Atlantic? Like many I started with The Atlantic Crossing Guide, which got me on my way. In addition to negotiating terms for a new job (which involved moving 450 miles), I set about finding a crew. Initially Ellen MacArthur was to join me, but she was offered a job on Alan Wynne Thomas’s 60ft entry – who says size doesn’t matter? Instead I was joined by Ashley Perrin. Ashley is a very enthusiastic sailor, but at eighteen had limited experience of handling a yacht on her own at night – all her sailing had been fully crewed. Her attitude and enthusiasm were enough though – and all credit to her parents for supporting her. Gatwick airport, 9 July 1996: I began to regret offering to bring out the spare main and 15ft battens. I’d put the battens into a drainpipe, and the lady from Virgin didn’t seem overly impressed by the statement ‘but Sally from your head office said it would be fine’. Luckily the head cargo-packer at Gatwick found space, and in the commotion they forgot to charge excess baggage. I was due to meet Ash at Boston Airport, as she was flying out after me. I’d hoped to meet her flight as I didn’t want her hanging around the airport alone – not just because I’m a gentleman, but where on earth could one find a replacement crew at such short notice? In the end I was delayed trying to reclaim the battens (I did find, however, that a smart shirt and cravat helps with customs), but Ash found me as I cut a swathe through the crowds. The car hire company was very decent about having this tube tied to the roof. Mary was waiting for us in Newport, still on a huge high from her excellent result, and the atmosphere was electric. We quickly got to work preparing the boat for her return journey, despite much talk of Hurricane Bertha approaching the coast. As it wasn’t due for three or four days, and in any case would probably head inshore before reaching Newport, I thought about setting off early and getting clear of it. However, both Gerry Rouf and Josh Hall said they were waiting, so I decided to learn from their knowledge and experience. – I was pleased we had been out the day before for a recce. There’s nothing like beating into a cold fog to settle you down into a rhythm, but we were sad not to see land fading away into the sunset. I mentioned Ashley’s attitude earlier. She was cooking supper that first night. We both felt nervous and not on top form, and for the first time in her life she was seasick – but then continued to cook supper. Huge respect. The first few days all merged into each other. It remained overcast and we were working hard, with reefs coming in and out every watch as both of us wanted a fast passage. Daily runs of 158-182 miles demonstrated how well QII goes to windward, but we wanted to see what she did off the wind! 20 July: Hurrah, we’ve got close enough to the magical 42Â°N 50Â°W to bear away onto the Great Circle route. Up went the fractional asymmetric – and the boat speed. And so time for a confession. We hit the Great Circle with a vengeance – I had double-counted the variation and we shot up north! Unbeknown to us our progress was being watched via Argos – on my return my father said what a good move that dash to the north had been, to gain best positioning on the weather systems! 21July: Winds of 30+ knots, with three reefs in the main plus the small jib, lead to some high speeds and much fun! Ash is in her element as she has now gained the confidence to know when to shake reefs in and out – I just get told to get out of my pit and help. She has suffered from severe bruising to her arms and sore hands. I can only admire how she keeps pushing herself, as it is tough physically (especially dodging the flying fish). I must learn sympathy. 22 July: Four reefs and the small jib through the night, but still averaging 9.75 knots with a top speed so far of 15.3! As the wind dropped in the morning I went to put up the fractional loose-luffed jib. Must remember that tack and clew are meant to be at the bottom. Had to wake Ash to help sort it out. I think she was amused. 23 July: Ash woke me from a deep sleep to say there was a strange light ahead and we were gaining on it quickly. I told her it was a planet and not to worry. She was right – it was a ship. I spoke to them on the VHF, a Canadian fishing boat that was hove to whilst sorting her nets. 24 July: Half way! Great sailing with masthead asymmetric. 25 July: Tilman definitely not correct reading material. 27 July: After a couple of days of poor weather the wind begins to pick up. We tack for the first time since day one! As night comes on the weather begins to deteriorate further, and although the weatherfax only gives a poor picture we expect it to get worse. Ash sees another ship (only the third of the trip) and we speak to a very excited Irishman (Michelle Jones had just won her third gold medal at the Olympics). He confirms that strong winds are forecast, so we bed down for the night with five reefs and a tiny jib. In the event the wind only got up to 37 knots, but as we were still doing 11+ knots down the waves we didn’t increase sail area – slowing these boats down is harder than making them go fast. Just as well my hair is blond, as it hides the grey hairs I got that night as we shot down big waves into very dark troughs. 29 July: 550 miles to Lymington! Needless to say, the wind has gone light from astern, so we’re sailing angles with the masthead kite up. The slowed progress has an effect on morale, with frayed tempers, but a wash and brush up followed by a Budweiser at supper helps. Ash is suffering from sore kidneys, but my torn chest muscles are slowly healing – I can now turn over without too much pain. 30 July: Wind back up and from the right direction – kite up, high speeds and high spirits! 31 July: Called my father via ship-to-shore to arrange our reception at Lymington. Good to speak to him again, though rather upset at his comment of ‘I’ve been expecting a call’. I’d thought we were a couple of days ahead of schedule. 1 August: Good fast sailing, but boy, oh boy, how come tides are so strong when they’re against you? We got them wrong at all the headlands. We sailed through the Hurst Narrows in a lovely evening breeze, and to our amazement a number of crews on local boats out racing stood up and cheered as we went by – they obviously thought Mary was on board! They say the best part is the last. We went screaming up the Lymington River (the propeller and shaft had been removed in Mary’s search for speed), so I dropped the main in good time, just for the breeze to die – it took nearly fifteen minutes to cover the last 100 yards! Seventeen and a half days, 3000 miles, great memories, lessons learned and, perhaps most important, a strong friendship formed – oh, and my qualifier for the OCC completed. Thank you, Mary, for giving me that opportunity.